So, we've had such a busy time since I last wrote that I haven't taken the time to update my blog. Last weekend, we went to Brett's wedding (David's brother). It was so nice. I adore the girl he married. Their wedding was so nice. I said that I'd like to do it all over again. I love love love weddings. I especially loved my own. I admit that I enjoy being the center of attention, when it's justified! Anyway, they got married in the Las Vegas temple. I'd never been there and it was just stunning!! Of course, it's up on a hill, away from the strip. We walked on temple grounds and the peace of the temple just flowed over me. I'd forgotten what it was like. I haven't been in a long time--it's so hard to leave a nursing baby. Anyways, we met up with David's family and passed off our kids to Uncle Jared and some of April's cousins and students to watch while David and I went inside. We were gone for just over an hour I think. 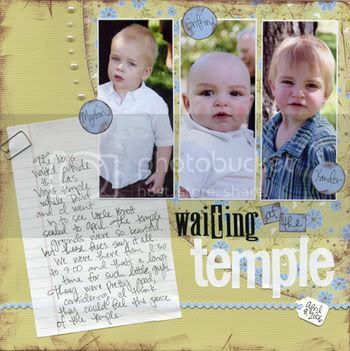 Then we hung around temple grounds for photos. We got there about 11:30 and left around 3:00. I'm so on the up and up that I have a layout done with some of the photos I took. Then I had a busy week of school stuff. I'm so so so so so so glad that this next week is my last week. I have about a million things to do, but once I'm done, I'm done. My photoshop class is going to meet at California Pizza Kitchen for our last class. Just that fact pretty much sums up how I feel about that class. Xander's potty training is going great. I'm amazed at his progress. He hasn't had an accident in days. Well, a peeing accident anyway. He still won't poop in the potty. Not sure what to do about that, but I've read that it's a pretty common problem, so we are just going to wait it out and not pressure him. He's even been waking up dry, which is so surprising! The next thing to work on is keeping clothes on his lower half. It's such a hassle to try to get him to get dressed each time. He's usually naked by the time David gets home. I actually don't really mind, but it drives David crazy! And then there was Easter. We had such a nice time at my parents' on Saturday. We dyed Easter eggs, which the boys thought was so cool. I couldn't resist and dyed a few myself, complete with crayon swirlies. Then we had an egg hunt. The boys were so excited. They've been watching the Easter Dora where she finds "prizes in the eggs" and that's all I've heard about for the last week. Made the mistake of telling Xander on Tuesday that we were going to have an egg hunt at Grandma's on Saturday. Yeah, he doesn't get the idea of time so well. I showed him on my calendar how many days it was. By the time Saturday came, I think he'd given up hope that we were really going to have a hunt! I took so many photos, but I think this has to be my favorite. 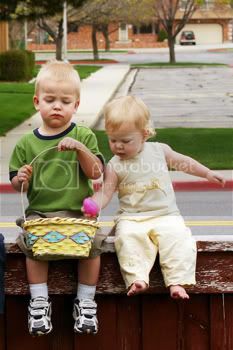 That's Maxton with his little cousin Madolin stealing an egg from his basket. Typical Maxton expression. Everything about this cracks me up. Oh, and don't worry, my mom is behind the fence, holding Madolin up. Oh, that picture cropped like that is SO dang cute and funny! I showed Hyrum and he said who they were. Maton and Maddy. lol.